Dear 3-D Friends and Web Site Customers. From time to time we will have items that are in limited supply, discontinued products, or occasionally a special one time purchase. It is not possible to list these items in our printed catalog, but, because the web page may be changed as frequently as needed, we will list these items on this page. Bookmark it and check it as often as you like for changes. Sometimes there may be nothing listed on this page. If not, try again whenever you feel like it. We also suggest that you email us regarding availability of any item on this page, as quantities may be very limited, and there is usually a slight delay in keeping the page updated. In 1969 The Gruber Foundation (as in William Gruber, the inventor of the original View-Master system) created this unsurpassed 3-D work on his passion, Chinese Art. 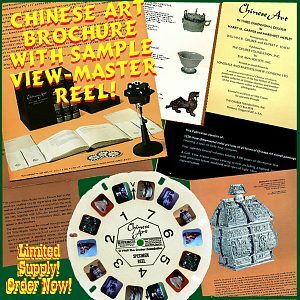 As a promotion for selling the original View-Master "Chinese Art in Three Dimensional Colour" four volume book and View-Master reel set to libraries and private collections (for $400 in 1969! ), the Foundation created this 8.5" x 11" high quality 7 page brochure, which included a special Specimen View-Master reel. In order to sell such an expensive set, the brochure was made to impress the potential buyer with the high quality of the production. It features a black cover with gold foil stamping, seven pages of text, which include samples of what some of the documentation in the books looks like. Most important is a unique Specimen View-Master reel, which is different from any of the reels included in the book set itself. The Specimen Reel contains seven representative Chinese Art objects taken from the thirteen dynasties represented throughout the four volumes. These brochures and reels have been kept in cool storage since 1969, and are in mint condition. They are a unique item for any View-Master enthusiast and collector. Supply is limited!